Talk about summer lovin’! 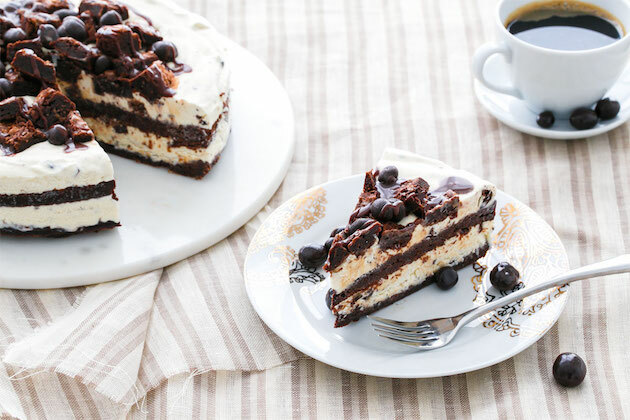 This ice cream cake has layers upon layers of goodness: a rich and fudgy brownie combined with a no-churn coffee-infused ice cream that’s as easy to make as it is delicious. It’s all topped with a mountain of brownie chunks, chocolate covered espresso beans, and a hot fudge drizzle. Making your own no-churn coffee ice cream (instead of using a store bought ice cream) gives you the flexibility to use decaf coffee beans with less caffeine. Granted, there still is espresso powder in the brownies and chocolate covered espresso beans studded through out the cake, but the effect is milder. If you are not a coffee fan, the basic no-churn ice cream base can be made into just about any flavor you can imagine. 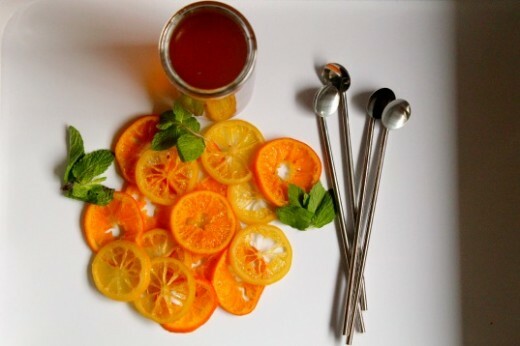 Maybe you could fold in chunks of fresh sweet cherries, a splash of bourbon and vanilla bean, or even infuse the cream with fresh mint in place of the coffee beans, following the same process as outlined below. But I digress, let’s get on with this recipe! 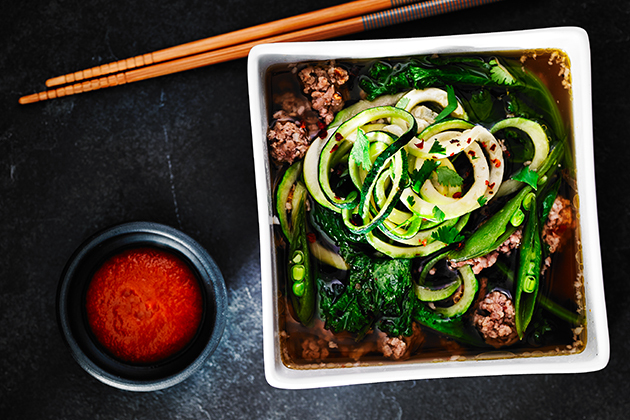 Start by preheating your KitchenAid® Double Oven Convection Range to 350ºF. 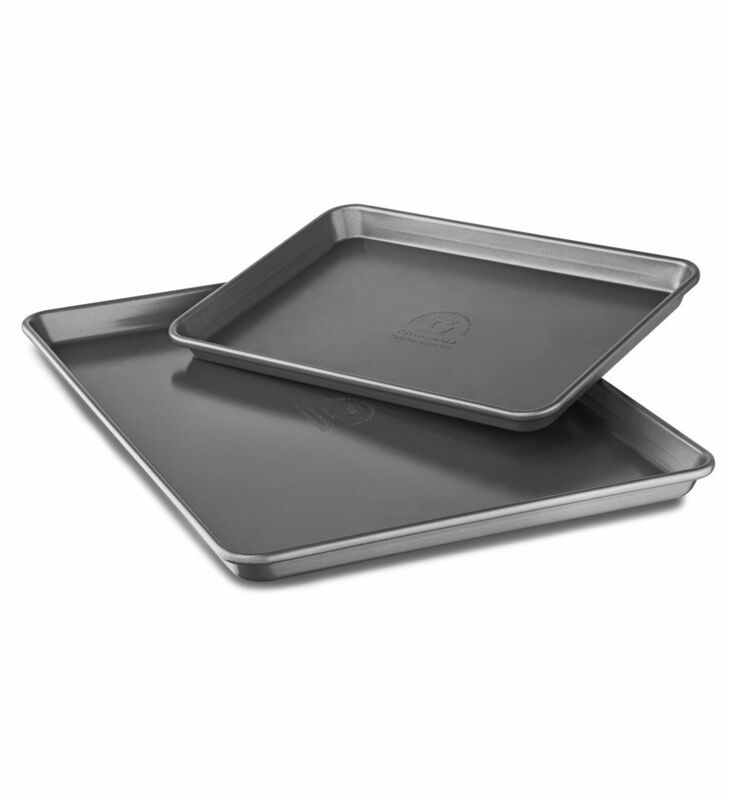 Meanwhile, line the Half Sheet Pan from your KitchenAid® Quarter Sheet and Half Sheet Pans Set with parchment paper. Lightly butter the surface. To make the brownie, melt chocolate in a double boiler or in the microwave on low heat. Meanwhile, beat together butter and sugar in the bowl of your KitchenAid® Stand Mixer fitted with the flat beater on medium-high speed (4 or 6) for 2-3 minutes, or until light and fluffy. Add the eggs, one at a time, beating well after each addition. Increase the speed to high (8 or 10) and beat for another 2-3 minutes, or until fluffy. Then, mix in the vanilla. In a separate bowl, sift together flour, cocoa powder, espresso powder, baking powder, and salt. Remove the bowl from your Stand Mixer and fold in the melted chocolate with a large rubber spatula. Then, sprinkle the dry ingredients into the bowl and fold until just incorporated. Spread the brownie mixture into an even layer on your prepared Half Sheet Pan. I bake this brownie on the Half Sheet Pan instead of a 13×9 pan in order to create a larger, thinner layer. With the Half Sheet Pan, you’ll have just enough brownie to cut out two 9” rounds to fit into your KitchenAid® Springform Pan during cake assembly. Each brownie layer will have the perfect thickness to compliment but not overpower the ice cream, while still leaving you some leftover scraps for a glorious mountain-of-brownie to top off your cake. When the KitchenAid® Double Oven Convection Range is preheated, place your Half Sheet Pan onto the rack and bake for 17 to 19 minutes, or until a toothpick inserted near the center comes out clean. I love my Convection Range, because the Even-Heat™ True Convection technology works to evenly and quickly bake this brownie into a deliciously fudgy base. When ready, remove the Half Sheet Pan and cool on a wire rack. Then refrigerate your Half Sheet Pan in your KitchenAid® French Door Refrigerator for at least 30 minutes (or more) to make the brownie easier to work with in the assembly phase. It’s time prepare the ice cream layer of this cake. This ice cream base is lightly infused with coffee beans by simply warming and steeping them in cream in the 3.0-Qt Saucepan from your KitchenAid® Stainless Steel 8-Piece Set on your Electric Range for about 30 minutes. This actually infuses a surprising amount of coffee flavor into the cream. 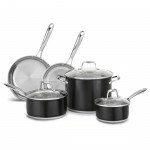 The 3.0-Qt Saucepan has a durable stainless steel base that is perfect for all my recipes; I love it! Allow the mixture to cool. 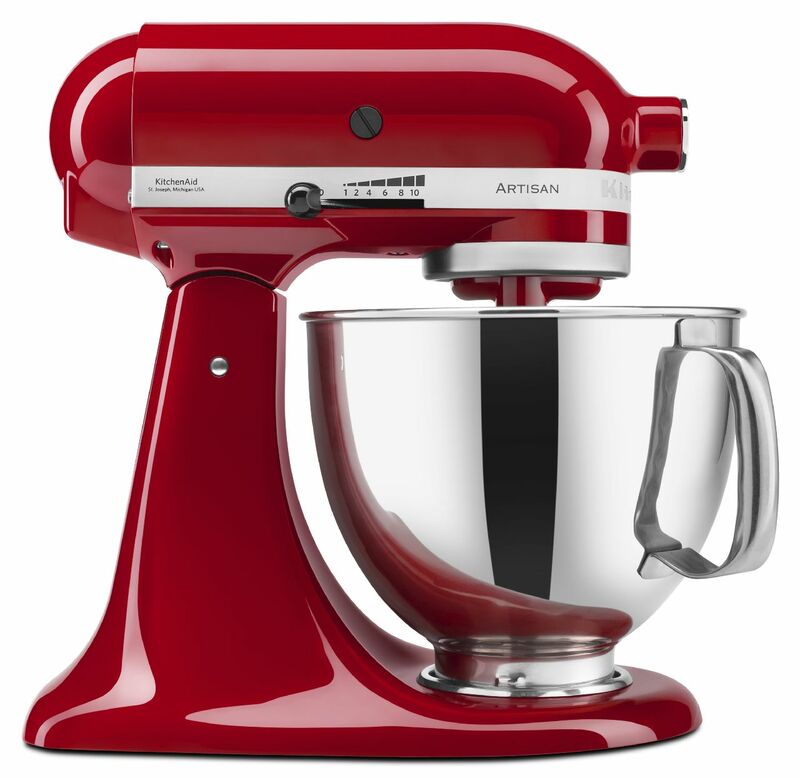 Then, pour the cream into your KitchenAid® Stand Mixer fitted with the whisk and mix on medium-high speed (4 or 6) until the cream forms soft peaks. In a separate bowl, pour in a can of sweetened condensed milk. Then, spoon in about 1/3 of the whipped cream from the bowl of your Stand Mixer, and fold to lighten up the mixture. Add the remaining whipped cream and fold until evenly incorporated and no streaks of bright white remain. Finally, fold in the chopped chocolate covered coffee beans. That’s it. No eggs to separate, no custard to thicken, no special equipment necessary to make this ice cream. After your brownie has finished cooling, you are ready to assemble this beautiful cake. 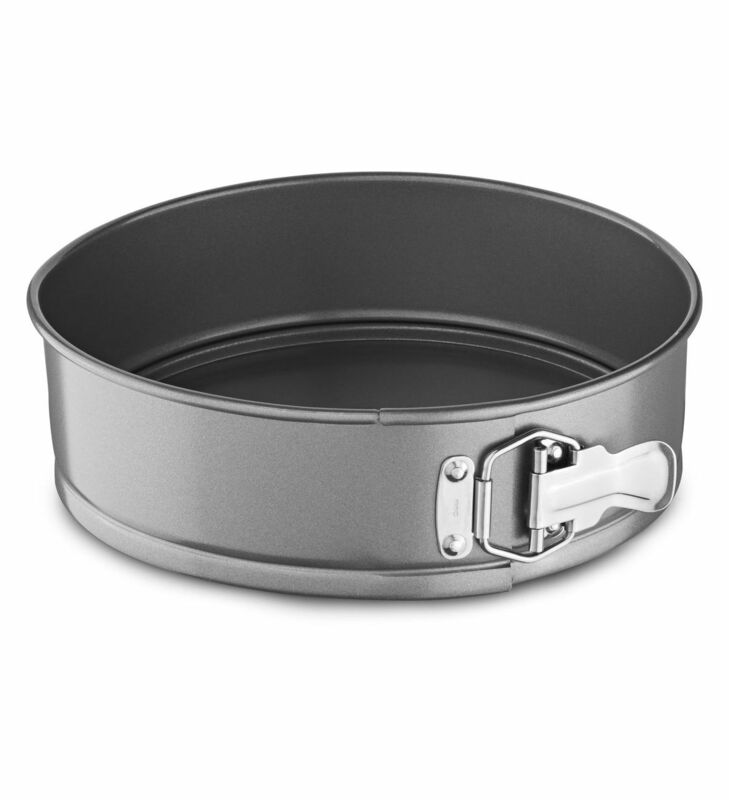 Detach the sides of your KitchenAid® Springform Pan. Using the bottom of the Springform Pan as a template, trace and cut out two rounds from the brownie in your Half Sheet Pan with a butter knife. Use a spatula to remove excess brownie and set aside. Then, latch the sides of the Springform Pan back into place. With an extra large spatula, carefully lift one of the brownie rounds and place into the bottom of Springform Pan, pressing down the edges into an even layer. Spread half of ice cream mixture evenly on top of brownie. Drizzle with about 1/3 cup of fudge sauce. Repeat with the second brownie round, followed by the remaining ice cream mixture. Cut the brownie scraps leftover from making the rounds into evenly sized squares, and pile them on top of the assembled cake in a decorative manner. Finally, scatter a few chocolate covered espresso beans on top, if desired, and drizzle with remaining fudge sauce. 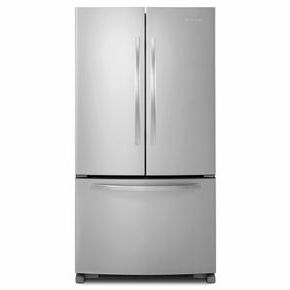 Place the assembled cake into your KitchenAid® French Door Refrigerator and freeze until completely firm. You need at least 4 hours of chill time at the very minimum, preferably overnight if you can manage to wait that long. The longer the cake chills the cleaner your slices will be. I’d even recommend bumping your freezer temperature down a few degrees to help the cake along even further. 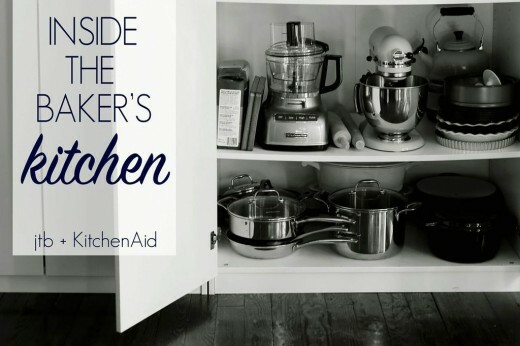 I love the triple freezer drawers in my KitchenAid® French Door Refrigerator, which pull out completely and make it so easy to freeze your fully assembled cake while keeping the layers level. My previous freezer would have required some tilting and maneuvering to get a pan like this inside, and when your layers are still soft that’s less than ideal. The KitchenAid® designers, on the other hand, were much smarter. It’s like this freezer was made for ice cream cakes! Once frozen, the sides of the Springform Pan should release cleanly and evenly, showcasing your beautiful layers. I’m obsessed with this cake, and I cannot wait for you to try it for yourself. Be sure to share your take on this Fudge Brownie Mudslide Ice Cream Cake recipe with us on Instagram using #MadeWithKitchenAid for a chance to be featured. 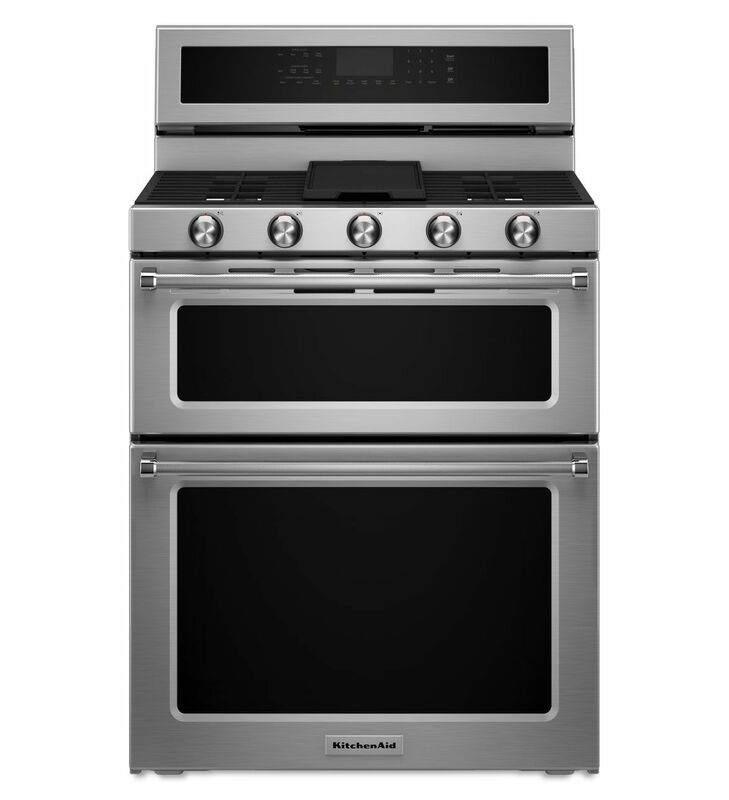 Preheat your KitchenAid® Double Oven Convection Range to 350ºF. Meanwhile, line the Half Sheet Pan from your KitchenAid® Quarter Sheet and Half Sheet Pans Set, with parchment paper and lightly butter. To make the brownie, begin by gently melting chocolate until smooth in a double boiler or in the microwave on low power. Set aside to cool slightly. In the bowl of your KitchenAid® Stand Mixer fitted with the flat beater, beat the butter and sugar on medium-high speed (4 or 6) for 2-3 minutes, or until light and fluffy. Add the eggs, one at a time, beating well after each addition. Increase the speed to high (8 or 10) and beat for another 2-3 minutes, or until fluffy. Then, mix in the vanilla. In a separate bowl, sift together the flour, cocoa powder, espresso powder, baking powder, and salt. Set aside the dry ingredients. Remove the bowl from your Stand Mixer and fold in the melted chocolate with a large rubber spatula. Then, sprinkle the dry ingredients into the bowl and fold until just incorporated. Spread into an even layer on your prepared Half Sheet Pan and bake for 17 to 19 minutes, or until a toothpick inserted near the center comes out clean. Place the Half Sheet Pan on a wire rack to cool completely, then refrigerate in your KitchenAid® French Door Refrigerator for at least 30 minutes (or more) to make the brownie easier to work with in the assembly phase. To make the ice cream, heat cream and coffee beans in the 3.0-Qt Saucepan from your KitchenAid® Stainless Steel 8-Piece Set over medium heat on your KitchenAid® Double Oven Convection Range until it just starts to simmer and steam. Remove from heat; cover and let steep for 30 minutes, then strain out the coffee beans and refrigerate the cream until completely chilled, at least 2 hours. Chilling the cream ensures that it will make a firm whipped cream in the next step. When completely chilled, pour the cream in to the bowl of your Stand Mixer fitted with the whisk. Turn on Stand Mixer to medium-high speed (4 or 6) and whisk until the cream forms stiff peaks. In a separate bowl, pour in your can of sweetened condensed milk. Then, spoon in about 1/3 of the whipped cream, and fold to lighten up the mixture. Add the remaining whipped cream and fold until evenly incorporated and no streaks of bright white remain. Finally, fold in the chopped chocolate covered coffee beans. To assemble the cake, detach the sides of your KitchenAid® Springform Pan. Using the bottom of the Springform Pan as a template, trace and cut out two rounds from the brownie in your Half Sheet Pan with a butter knife. Use a spatula to remove excess brownie and set aside. Latch the sides of the Springform Pan back into place. With an extra large spatula, carefully lift one of the brownie rounds and place into the bottom of Springform Pan, pressing down the edges into an even layer. Spread half of ice cream mixture evenly on top of brownie. Drizzle with about 1/3 cup of fudge sauce. Repeat with the second brownie round, followed by remaining ice cream mixture. Cut the brownie scraps leftover from making the rounds into evenly sized squares, and pile on top of the assembled cake in a decorative manner, scattering a few chocolate covered espresso beans on top as well, if desired. Drizzle with remaining fudge sauce. Place the assembled cake into your KitchenAid® French Door Refrigerator and freeze until completely firm, at least 4 hours or overnight. To serve, remove the cake from freezer and release sides of Springform Pan to leave behind clean layers. Use a large knife to slice into wedges and serve immediately. Return any leftover cake to freezer to enjoy later.